The stylish and attractive Amish Cambria Hutch will brighten up your dining room and bring a comfy and complete feel to your home. The solid wood grain pattern complements the whole piece perfectly bringing together every aspect of this brilliantly crafted hutch. Choose your wood and finish type to have it match your own style preferences. Also choose from our other custom options including the size, which can be made in a three door 60" width or a four door 72" width depending on your dining room space. The three door hutch shown is in a Walnut Wood with a Wormy Maple Wood top and natural finish. The four door hutch is shown in a Cherry Wood with Michaels Cherry stain. Choose your own wood and finish combination to make it your own. Touch lighting is also included as a great standard feature which provides an attractive presentation of your valuable display items being showcased behind the top glass doors. Each piece of this American made hardwood Amish furniture from The Townline Collection is handcrafted with the highest commitment to top quality craftsmanship and durable construction that will last generations. The materials used for each piece are premium North American hardwoods hand selected by these talented Amish furniture artisans. 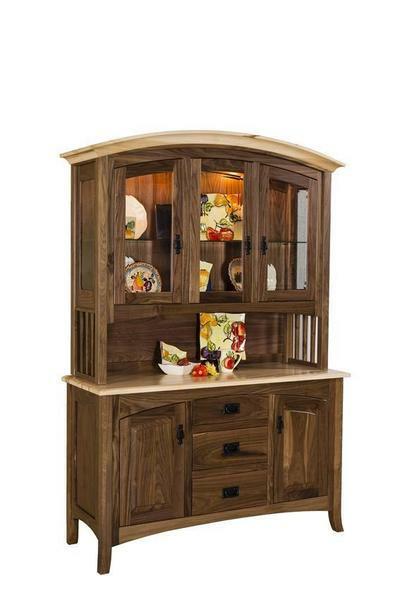 Explore your options on this Cambria Hutch or compare it to some of our other Amish Hutches here at DutchCrafters. If you really like the look of this Amish Cambria Hutch, add the matching Amish Cambria Sideboard or Amish Cambria Sideboard with Long Doors to your dining room furniture collection.